This is a 5 reel, 3 row online slot from Pragmatic Play, belonging to the animals and nature genre and set in the African savanna and featuring a full cast of all the exotic animals you’d find out there. It features 20 paylines, the RTP is 96.53%, and there are free spins and super re-spins features to boost your chances of a win. We’re proud to offer it here at UK Slot Games, where you can also play over 600 slot games, including ‘Starburst’, ‘Rainbow Riches’, ‘Fluffy Favourites’ and ‘Bonanza’. The sun drenched wilderness of Africa is the backdrop for Great Rhino, with vivid scenery and beautifully rendered wildlife on the reels to give you a truly captivating flavour of being out in the wild yourself on safari. A backing track of authentic African music that wouldn’t be out of place in the Lion King movie is there to accompany you as you play, and if you’re not planning to travel to the African Continent for your next major holiday, this might just be the next best thing. Pragmatic Play have something of a reputation for creating excellent animal-themed games (we’ll have a look at some of them later on), and this is a standout offering even among the crowd that they already have. It was released towards the start of 2018, and therefore represents a modern take on what’s traditionally been a popular online slot genre. Every possible care has been taken to make the experience feel immersive; the reels are set upon a wooden frame, as if the mechanics of the game had been taken from the land the creatures roam within. The lower value symbols of the game will not need introducing for regular slot game players; they’re the tried and trusted cards, represented by J through to A. Beyond that come the animals; and in our game-based mini zoo we have a flamingo, a hyena, a crocodile, a leopard and of course the great rhino of the title. He’s the real star of the show. The rhino makes a secondary appearance in the game contained on a blue disk (the appearance is as if the animal had been set into a brightly coloured medallion), which serves as the wild. That replaces all other symbols to form winning combinations, with the exception of the scatter. That takes the form of a baobab tree. That’s a very thick tree that can only be found on the African continent; who knew online slots could teach you about geography? Scatters will be of great benefit to you when they appear on the second, third and fourth reels. Great Rhino is a fundamentally very solid game, and therefore doesn’t necessarily need all the bells and whistles of too many bonus features to keep it entertaining. Instead of trying to complicate the game, Pragmatic Play have restricted themselves to just offering two; both of which have the potential to add serious money to your winnings. 1. Free Spins: Free spins are generally the minimum expected of a modern slot in terms of bonuses, and they’re present and correct in Great Rhino. This is quite a gentle free spins round in comparison to other contemporary titles. You’ll need a minimum of three baobab tree scatter symbols on reels two, three or four to trigger the game, and you’ll be rewarded with ten free spins. That’s not a huge amount; and the round doesn’t re-trigger if further scatters are found; but the rhino does become an additional wild during those free spins to give you many more chances to find a win. 2. Super Respin: Super Respin is the feature that truly has the potential to win you a big prize. It’s not easy to obtain; you’ll need at least two entire reels full of rhinos to trigger it. One you’ve done that, they’ll freeze in place for three re-spins. The hope here is that during those re-spins you’ll find another rhino, which will also freeze in place and award you an additional free spin. If you can completely fill the reels with rhinos you’ll win the Grand Jackpot, which is usually around £500. Fourteen rhinos - close, but not close enough - wins you the Major Jackpot. That comes in a little closer to £350, and is still nothing to sniff at. A quick look at the gaming portfolio of Pragmatic Play, who were founded in 2007, tells you that they’re a design company with a theme; all of their games have a definite visual feel to them, and many of them use the old West as a setting. They have over 100 games on their roster, the highlights of which include Wolf Gold, Gold Rush, da Vinci’s Treasure, Madame Destiny, Peking Luck and, of course, Great Rhino. ”Join the win stampede in Great Rhino, the 3x5 20 lines video slot. The rhinos are stacked on all reels and when two stacks hit, the Stampede Respin round triggers and more rhinos are added to win. Pragmatic Play tend to keep their promotional text short and sweet; they have the confidence to know that the quality of their products will do all the talking for them. Great Rhino was only released towards the start of 2018; it’s it its honeymoon period as far as slot games go. If the game experienced prolonged success, it may well be that Pragmatic Play decide to release a sequel to it, or variations upon the original game. Time will tell. They do have a few similar titles though; the world of animals has provided constant inspiration to the development team at Pragmatic Play, and a couple of their best offerings are along the same lines. There’s a big clue in the title that this game might make use of the same environment that plays host to Great Rhino. Hot Safari is a popular online slot from Pragmatic Play; arguably not quite as pretty to look at, but with a similar cast of exotic animals to Great Rhino (no flamingo here, though!). It also has the same spirit of simplicity as Great Rhino in that it doesn’t try to blind its players with bonuses and extra features; free spins and multipliers are all you can and should expect from the bonus rounds. It isn’t flamboyant, it isn’t flashy, but it’s a solid and engrossing game with an RTP of 96.17%. Another animal themed slot game from Pragmatic Play, and one of the stars of their entire roster of games. Wolf Gold has won awards for both its design and its playing style, and was one of the most played online slots of 2018. Granted, it doesn’t use the animals of Africa as its backdrop, but it is animal themed. The continent has just been shifted from Africa to North America. One of the things about Wolf Gold that’s made it so popular is the unique approach it takes to its bonus rounds, combining free spins with multipliers, and therefore offering lucky gamers the chance of big wins. It’s an atmospheric and enjoyable slot, with an RTP of 96%. The developer wouldn’t be making fresh animal themed slots in 2018 if there wasn’t a market for them, and the evidence for that market’s existence comes from the popularity of several other animal themed slot games that already exist. There are plenty out there in the online slot world, but here are a few of the better ones, who share the most striking similarities to Great Rhino. We’re not calling them outright copies, or clones of the original; some of them were created long before Great Rhino was even an idea in the heads of its development team; they’re just part of the same extended family of games. Here’s another major slot game developer, Net Ent, making their own entry into the jungle; literally. Jungle Spirit: Call Of The Wild goes for a different animation and graphical style than Great Rhino, it’s gritter, but still well executed. Featuring five reels, three rows and 243 ways to win, accompanied by a generous RTP of 96.47%, this is also a game that offers depth and variety across the board, making it easy to understand why gamers love to play it so much. Expanding wilds and two additional bonus features make the game an interesting one to play, although those who love Great Rhino for its comparative simplicity might find it to be too complicated. This online slot comes from a slightly less well known developer, namely Tom Horn Gaming. It’s a solid and reliable five reel, three row game with fifteen paylines, and an RTP of 96.41%. Once again you’ll see a similar cast of exotic animals as those who are present in Great Rhino, but the animation and graphics aren’t on the same level. It’s also low on features and bonuses. Despite that, it’s a fun, simple game that becomes generous when the wild symbols come into play. Eyecon make games around a variety of themes, and although they can often feel like they’re using a template, they vary rarely put out a game that isn’t fun to play. Stampede is most definitely fun. It’s also one of the more expansive games on the Eyecon roster, with a staggering 1024 ways to win. There are rhinos in the game, but they’re playing second fiddle to an elephant. We’re pretty sure that’s how the pecking order works in real life, too! Stampede has an RTP of 95.26%, and is also available to play here on ukslotgames.com. Well with a name like Raging Rhino, this one just had to make the list, didn’t it? It’s a WMS Gaming product; a company who have since been acquired by Scientific Gaming. It’s also several years old, so although it doesn’t look as sharp or polished as Great Rhino, we can excuse it for that based on the time that’s passed between now and then. This is one of the widest playing areas we’ve ever seen; six reels, four rows, and 4096 ways to win. There aren’t many bonus features, but with all that action on the reels, it doesn’t really need them! It might be a little too much to keep track of for most gamers, but it offers an RTP of 95.91% to those who think they’re p to the task. You would expect that a game that was not only released within the last couple of years, but released by a company that openly prides itself on designing online slots that are perfectly functional on smartphones, would appear flawless on a smartphone. And of course it does. Nothing of the game is lost at all; the sun baked earth of the backdrop, the atmospheric backing music and the clean sharp reels are all here, just as they are on the desktop version. The game optimises and rearranges its layout depending on whether you have your phone in portrait or landscape mode, and it doesn’t shrink the playing area in order to do so, which a lot of mobile versions of games do. All the buttons are nicely proportioned for your fingers, and everything is easy to find. You can even activate turbo spin by holding your thumb down on the spin button. Curiously, although the general belief is that most gamers go into portrait mode when they’re playing mobile slots (i.e. they hold their phone sideways), Great Rhino actually looks better in portrait mode. It’s perfectly playable either way, but you get more of the scenery (plus a constant reminder of the current Grand Jackpot) when you’re holding the phone upright. We can’t speak positively enough about the mobile version of Great Rhino. This is the standard that all developers should aspire to when they’re trying to make their games workable for mobile gamers. It might even be better than playing it on a desktop. Pragmatic Play say that their philosophy is ‘mobile first’ when they’re designing new games. Based on this evidence, they’re right. When Great Rhino was released, the gambling directory website World Casino Directory saw fit to run an article covering the game. You might expect that as a minimum every time a new slot game is released, but it isn’t. There are new online slots released almost every day, and many of them appear without fanfare. The review notes that Great Rhino is ‘another example of the quality content that Pragmatic Play is known to create’. It’s safe to say they liked it. Even the mainstream news are paying attention to games that come from Pragmatic Play. SBC News have written a piece looking forward to the 2019 Ask Gamblers Awards in Belgrade, and are already excited about who might win what. 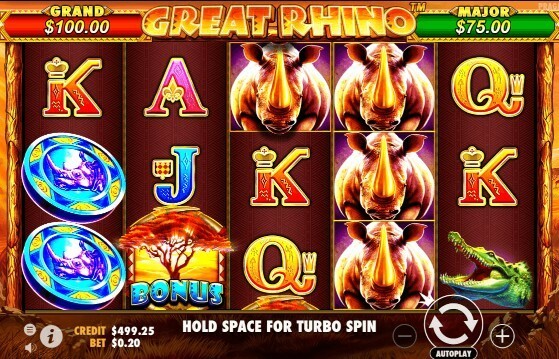 Within the article, it’s revealed that Great Rhino has been shortlisted as a contender for ‘Best Slot’. That’s one of the highest levels of praise that a slot game could receive; Ask Gamblers awards are decided on by the gaming community, so just to be nominated is a sure sign of how well the game has been received by players. Why Is UK Slot Games The Best Place To Play Great Rhino? You’ve read about the game and its features. You hopefully now understand how the bonuses work. You’ve seen where it stands in terms of industry praise, and you’ve also seen how well respected and well qualified Pragmatic Play are as a developer. By this point, we’re hoping you’re looking forward to trying Great Rhino out yourself. It was one of the highlights of the online slot playing world in 2018, and it’s well worth your time to find out whether it will appeal to you in the same way; and of course whether it has the potential to be your new lucky slot! Thank you for reading this review on ukslotgames.com, we appreciate it. Since you’re already here, if you are considering playing the game yourself, we’d love you to stay right here and play it with us. Secondly, we don’t force you to deposit money when you first sign up. Everybody is welcome to make an account, and you can then browse our entire catalog to find a game you really want to play before you hand over any money. Great Rhino is a fine place to start, but there’s no reason to stop there! In fact, we do the opposite of forcing you to hand over money. When you sign up, you could win up to 500 free spins on our games just for doing so!